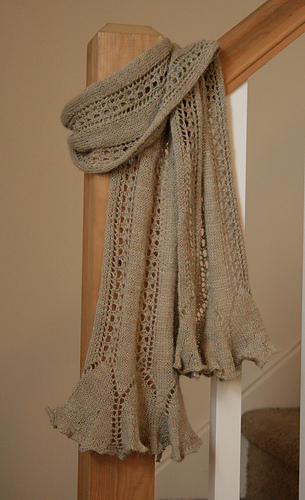 Yarn Substitution: Since the original yarn is proving hard to find, I recommend Classic Elite Silky Alpaca Lace. 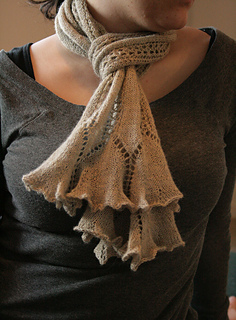 It’s similar in drape and twist to the original yarn. 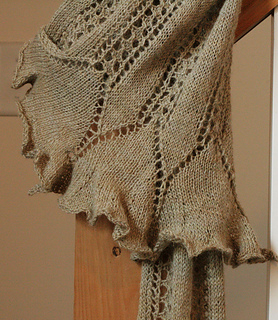 The yarn is an artisan laceweight from Skylark Yarns called Les Oiseaux. 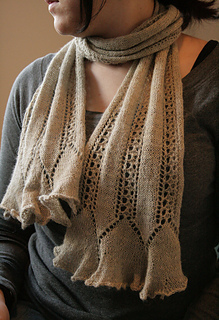 The colorways are beautiful and subtle, and the whole scarf took one skein of the yarn. 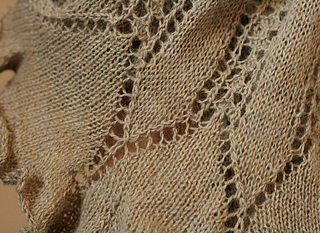 This simple lace pattern is easy to memorize and easy to work. 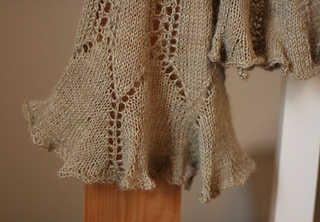 When you reach the ruffles, the pattern grows seamlessly from lace to increases that create the ruffles. The weight of the alpaca and soy fiber blend of this yarn creates a wonderful drape, which allows the ruffles to hang beautifully.